Somebody disturbed a beehive hanging on the third floor ledge of our apartment causing unrest among the countless, inch-sized yellow buzzing blobs. Teeming with vengeance, they entered our humble home through every opening they could find. The sight of this huge swarm of bees brought immediate fear in my eyes. As I panicked and started closing all the balcony doors, my son calmly told me, “Mama see, they are attracted to light. 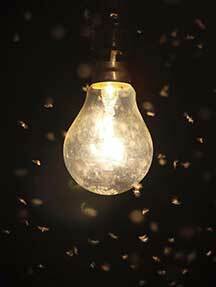 Let’s close all lights except one.” The bees soon swarmed around the lone light in one of the bedrooms. We then opened the balcony door of that room and switched off the light before shutting the door of the room. Within the next half an hour, we were free from all the fearful buzzing sound in our house. A seven-and-a-half-year-old boy had used his presence of mind, had displayed a high order skill to make connections between what he was taught in school, the stories he had read, and the various videos he had seen on collection of honey. He applied his knowledge to solve a problem that had me all anxious and flustered. The problem at school and with us parents lies with the over emphasis on a particular style in learning and writing. For instance, while solving word problems in math, the teacher expects children to write the statements in a particular way. Marks are cut if the statements are not written. What happens is the child puts in more effort to master the skill of writing the answer in a particular format sidelining the main purpose of developing the skill to understand and solve a word problem. This often results in confusion in the child followed by reluctance and later a fear or phobia toward math. We need to grow out of this fixation on technique, style and format, and provide children an open ground to explore and find ways to arrive at the solution. The author is a social development professional who has now enrolled for an MA in education at Azim Premji University. She aspires to contribute to teacher training and curriculum development. She can be reached at sharmilagovande@gmail.com.